superheroes (such as Space Ghost and The Mighty Mightor) Of course, there was a transition phase. Hanna-Barbera's very first superhero was a four-limbed talking insect who walked on his hind legs. Atom Ant was first seen on Sunday, September 12, 1965, when NBC aired a half-hour special titled The World of Secret Squirrel & Atom Ant, for the purpose of introducing viewers to a couple of its new Saturday morning stars. The actual Atom Ant/Secret Squirrel show, titled (imaginatively enough) The Atom Ant/Secret Squirrel Show, began a few weeks later, on October 2. Atom's co-star was a response to the James Bond (related, but it was commercial and contrived) craze. The whole two-star show was an hour long, but it was formatted just like most of the cartoon shows that came before it — each star had a segment about as long as a theatrical cartoon, and lesser characters appeared in similar segments of their own. With an hour to fill, there were six segments. The other four featured Precious Pupp (a Tweety Bird type, appearing innocent but actually delighting in mischief), Squiddly Diddly (another riff on the Yogi Bear/Wally Gator theme, this one pitting a marine park resident against the park's supervisor), Hillbilly Bears (title tells all) and Winsome Witch (a kid-friendly witch character, like Wendy). Both Don Messick (Ricochet Rabbit, Ruff of Ruff & Reddy) and Howard Morris (Jughead in a couple of incarnations of Archie's animated show, Magilla Gorilla's Mr. Peebles) did Atom Ant's voice at various times. Other voices heard regularly on the show were those of Janet Waldo (Penelope Pitstop, Judy Jetson), Paul Frees (Ludwig von Drake, Barney Bear) and Mel Blanc (Bugs, Daffy). 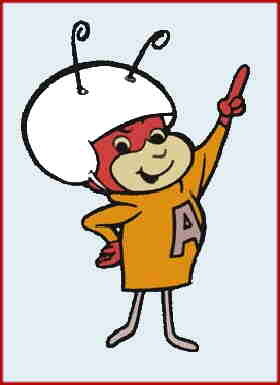 Atom Ant was never a big comic book star, appearing in a single Gold Key comic book in 1966, and, years later, co-starring with Secret Squirrel in an issue of Archie Comics' Hanna-Barbera Presents. He did, tho, appear on his share of toys, lunchboxes and children's clothing. The Atom Ant/Secret Squirrel Show lasted about a season and a half, before being split into two regular-size shows on January 7, 1967 (with Precious Pupp and Hillbilly Bears going with Atom). They were re-joined in September of that year. Altogether, they ran three seasons. Most of the six characters from the old Atom Ant/Secret Squirrel show have been out of the public eye for years. But they can still be spotted occasionally, in out-of-the-way cable slots. Text ©2002-08 Donald D. Markstein. Art © Hanna-Barbera.